A practical guide to managing your axial SpA (AS) flares with space to write in your own notes and information from your rheumatologist and physiotherapist. 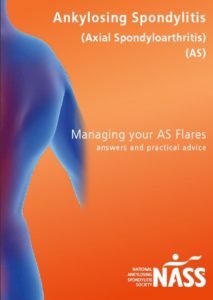 This is a practical guide to understanding and managing the flares that can happen with axial SpA (AS). It includes information on medication, breathing techniques and highlights some simple pain relieving techniques. There’s plenty of space for you to write in your own notes and information from your rheumatologist and physiotherapist. This will help you build your own personalised approach to flares management.